“After working with the Hispanic/Latino community in Sampson County, NC, I realized that I could serve as the voice of the Hispanic/Latino community and dedicate my time to create a greater impact as a liaison between the Hispanic/Latino community and the North Carolina government. 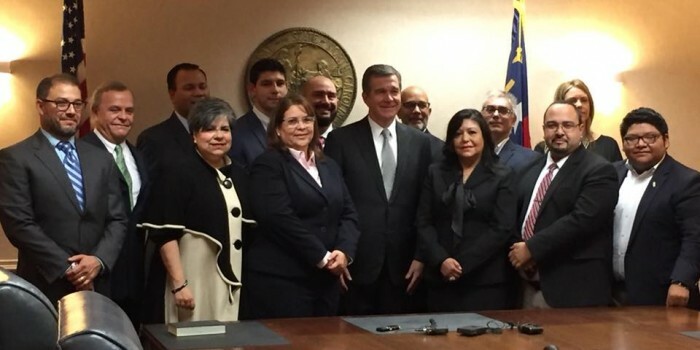 It is an honor to be able to serve Governor Roy Cooper as a member of the first Advisory Committee on Hispanic/Latino Affairs,” Travers said in a press release by her employer, Market America. Gov. Cooper signed Executive Order No. 23 to establish the council on Oct. 5, 2017, before then appointing Travers. He also signed a proclamation declaring Sept. 15 — Oct. 15 Hispanic Heritage Month in North Carolina. “North Carolina is a richer, more vibrant place thanks to countless contributions from generations of Hispanics and Latinos,” Gov. Cooper said. Travers is a Foreign Legal Consultant for Market America’s corporate office in Greensboro, North Carolina. She is also a member of her Community Emergency Response Team (CERT) and the Local Emergency Planning Committee. Travers graduated from Wake Forest Law’s LL.M program in 2013 and was a member of the Pro Bono Society, Hispanic Society and Environmental Society.